When will Rio Tinto disinvest from West Papua mine? Following the accusations, recriminations and resignations surrounding Bumi plc and consequent calls by financial commentators for better regulation by the London listing authorities, activists and NGOs are calling on the government to explain to the UK investing public why it blocked an amendment to the Financial Services Bill which would have placed a responsibility upon UK regulators to "foster ethical corporate behaviour, including respect for internationally-recognised human rights" (1). The amendment to the Financial Services Bill, currently being scrutinised in the House of Lords, was tabled by Lord Wilf Stevenson. However, at the request of Treasury Minister Lord Sassoon, it was withdrawn after the minister made clear that the government does not see vigilance over corporate ethics to be part of the new financial authorities’ remit. A similar amendment was overruled when the Bill was debated in the House of Commons. 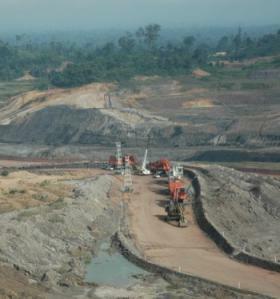 The London Mining Network (LMN) has demonstrated time and again how light touch regulation of London-listed companies has allowed for years mining corporations like Bumi plc, and individuals associated with such companies, to mislead investors and the public over the damage that their companies' activities do in the countries where they operate. In March this year, the LMN published a report (2) outlining these issues with case studies of various mining companies, including Bumi plc, making recommendations for the proposed new Financial Conduct Authority. However, it is not just civil society organisations calling for better regulation, a recent editorial on the Bumi case by the Financial Times (3) criticized the listing regime and called for a governance clean up of companies “before they list and not after”. 3. See Financial Times editorial: 'Fool's Coal', 15 October 2012. Down to Earth's analysis of Bumi’s record and recommendations for change in regulation by the listing authority in the UK can be found here. For a brief report of Bumi plc’s first London AGM click here.